Хороший повод оживить почти забытую рубрику: во вчерашнем номере еженедельника the Times Higher Education (THE) центральный ("feature") материал (анонс о котором вынесен на обложку) посвящен состоянию российских университетов в контексте их (и государства) стремления получить надлежащее признание в международных рейтингах. Так что я не могу пройти мимо темы, которая постоянно освещается в моем журнале (да и и "настоящих" СМИ я не раз высказывался). Статья журналиста Джека Гроува (Jack Grove) написана в спокойном доброжелательном тоне и на удивление компетентно. Не знаю, владеет ли автор русским языком, но он побывал в Москве, причем разговаривал не с каким-нибудь Садовничим (который известно что может наговорить), а с людьми компетентными - и с министерскими руководителями (замом Ливанова Александром Повалко), и с практиками (в частности, проректором ВШЭ Марией Юдкевич, которая к тому же в университетской тематике специализируется, и другими сотрудниками "Вышки). Кроме того, статья содержит немало свежих цифр, позволяющих взглянуть на предмет в мировом контексте. Конечно, можно предъявить и немало претензий. Лично мне особенно жаль, что автор ни единым словом не упомянул "Диссернет" - думаю, я не один такой, кто считает, что масштабные нарушения академической этики имеют самое прямое отношение к уровню и результативности научного выхода российских ученых, да и к уровню преподавания в университетах (на следующей недели у меня будет повод развить эту темы здесь). Без радикального улучшения ситуации именно в этой сфере вся эта амбициозная программа "5-100" (которой в статье уделено немало внимания) по определению не может быть успешной. Или, скорее, может быть успешной только в смысле поверхностного пиара (российские власти власти научились точечно вкладывать деньги в ориентированные на зарубеж чисто имиджевые проекты, позволяющие менять не реальность, а ее подачу; подозреваю, что ведущие производители мировых рейтингов уже озадачены щедрыми предложениями о взаимовыгодном сотрудничестве). Впрочем, в статье имеется "врезка", в которой, в частности, описывается ситуация с преследованием профессоров Андрея Зубова и Михаила Саввы. Очевидно, что от одной статьи нельзя ожидать рассмотрения всех многообразных проблем, особенно тех, которые больше проявляются внутри страны. В целом, повторю, это качественный материал. Ниже я, как и принято в "цитатной" рубрике, приведу обширные выдержки в оригинале (статья объемная, желающие прочитать ее от начала до конца могут сделать это по ссылке). В основном я старался процитировать фрагменты с фактическими данными. ... In the Times Higher Education World University Rankings 2014-15, Moscow State – Russia’s most prestigious and highest-ranked university – is 196th in the world, and occupied positions in the low 200s for the previous four years. Meanwhile, Russia’s oldest higher education institution, Saint Petersburg State University – the alma mater of eight Nobel laureates, dozens of world-renowned scientists and Russian president Vladimir Putin – did not break into the top 400, despite an illustrious history spanning almost 300 years. Siberia’s Novosibirsk State University, founded in 1959, is the only other Russian institution to make the top 400. Some commentators have asked whether these results present a fair picture of their performance, arguing that much of the research published in the country’s 2,000 or so Russian-language journals goes unrecognised owing to the methodologies used to compile global league tables. They also point out that much high-quality research is located in institutes, such as the Russian Academy of Sciences, which is home to 45,000 researchers. But many sector experts say that Russia’s low standing in league tables is warranted – and that it is the result of chronic underinvestment over decades, a dysfunctional system for encouraging academic talent and a complacent reliance on past Soviet glories in science. “Russian universities are bit like collapsed stars – they are still giving off light, but what produced that light disappeared many years ago,” says the vice-rector at one Russian university, who asks not to be identified. In an attempt to fix the problem, in 2013 Putin launched an ambitious plan, Project 5-100, that aims to place five Russian universities in the world’s top 100 by 2020. One of its key objectives is to ensure that at least 10 per cent of Russia’s academics and researchers and 15 per cent of its 7 million students come from abroad. The resources associated with this scheme are currently concentrated on 15 universities (out of 36 institutions that applied for grants in 2012), with more set to be cut out of the group each year in an X Factor-style elimination to decide the final five. However, investment in Project 5-100 is relatively modest, with about 44 billion roubles (currently worth some £448 million) available for 2013-16. In comparison, Germany committed €1.9 billion (£1.4 billion) for the first stage of its Excellence Initiative (2006-2011) and France put €7.7 billion into plans to improve higher education, according to a European University Association report published in December. Project 5-100’s international spending power has also been hit by the collapse in the rouble’s value amid falling oil prices and sanctions imposed by Western governments. With economists predicting that the country could be facing its first recession in five years, the present economic climate is likely to cripple efforts to recruit researchers from overseas. Moreover, Russia’s pariah status in the wake of its sudden invasion and annexation of Crimea and warmongering in eastern Ukraine will also do little to help academia improve its international links. In post-Soviet times, average salaries for academics have been lower than the average per capita income in Russia, with professors earning less than a professional holding a master’s degree. This has led to a massive brain drain – estimates indicate that approximately 80,000 scientists left Russia in the early 1990s alone – while not enough young Russians are entering academia to replace an ageing academic cohort, many of whom are nearing retirement. Some 26 per cent of university staff in Russia are now over the age of 60, according to 2012 figures from the Russian Federal State Statistics Service (Rosstat), compared with 9 per cent of UK university staff in 2012-13. Indeed, many believe that it is Russia’s academic system – still informed by outdated Soviet thinking – that is the major barrier to improvement, rather than just a lack of funding. “Brilliant people, bad system,” is how Philip Altbach, director of the Center for International Higher Education at Boston College in the US and a member of the international advisory panel for Project 5-100, sums up. “Despite all Russia’s problems, academics are trained well, get really good jobs and are very productive outside their country,” says Altbach of the academics who leave. 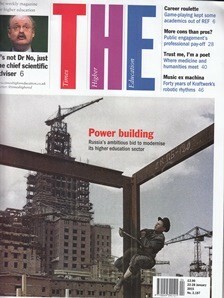 But, he adds, “the constraints on productivity and publications in many Russian universities are considerable”. The lack of academic mobility is one of the major problems, with researchers often remaining at one university, usually their alma mater, for their entire career. That low mobility between universities is exacerbated by a lack of transparent information about opportunities elsewhere, with external grants, fellowships and summer school places dependent on approval or recommendations from senior staff, says Yudkevich, who sees such practices as “discriminatory” to younger academics. Within this system, in which loyalty to professors is highly prized and reciprocated with offers of jobs or preferential treatment, “open” competitive hiring is widely seen as a charade; external candidates cannot compete with a well-connected PhD student from within the institution. The lack of a peer-review culture is also damaging, adds Yudkevich. “All expertise and review processes are, in general, extremely personalised,” she says, adding that good relations with colleagues are needed to secure publication in local journals. Establishing more open and trustworthy recruitment and promotion procedures will be a key plank in any efforts to resuscitate Russia’s “inbred” university system, but the underperformance of its existing research staff is perhaps the more pressing issue if Russia hopes to meet its 5-100 targets. According to a Thomson Reuters report on the research outputs of G20 countries published in April last year, Russia’s 447,000 researchers published just 26,500 papers indexed in the Web of Science in 2013. In contrast, Germany’s 328,000 researchers published nearly four times as many papers (about 95,000), slightly fewer than the UK’s 100,000 papers, produced by 262,000 researchers. Among Russia’s BRICS comparators, China’s researchers are more than twice as productive and South Africa’s more than four times so. “I hope funding for the 5-100 project persists, even if government budgets are tightened,” says Timothy O’Connor, vice-rector of academic affairs at Moscow’s National University of Science and Technology. “A fundamental change of culture takes a long time; otherwise initiatives are ephemeral and not long-lasting,” he adds. To many, however, the prospect of the wounded Russian bear – assailed by financial crises and economic sanctions – finding the resources and the willpower to revive its once-great academy looks increasingly doubtful.